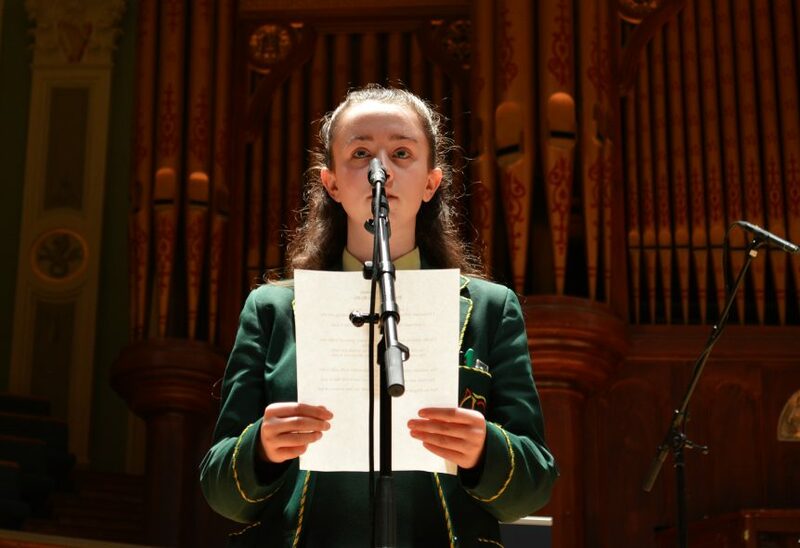 The winner of the Individual Seamus Heaney Award for Achievement 2018, Rhiannon Reilly (from St Catherine’s College in Armagh) on stage at the Ulster Hall, Tuesday 13 March 2018, reading her poem ‘Visiting Hours’ . The Group winners of the award were Dr Ross Thompson’s Year 11 class from Victoria College Belfast. Listen to Rhiannon’s winning poem below. I went to visit Kate on Friday. I found her sitting alone on the blue chair looking out the window. I said hello but she didn’t recognise who I was. On the table by her side sat a half empty glass of what was now warm water. An old white blanket spread out across her bed. The ceiling with a motored fan above our heads. The weather outside was dark and miserable with only a few street lights. The time was only around six o’clock but it felt like it was night. And we forged and forced conversation into the silence of her words. copyright information: The copyright for the anthology ‘In Other Words’ lies with Community Arts Partnership. the copyright for this poem (audio and text) lies with the poet (Rhiannon Reilly). Copyright requests can be made c/o Community Arts Partnership.